There are many events in Amsterdam taking place once a year. Here's a short list of the most big ones or the typically Dutch like Sinterklaas and Koninginnedag. The Holland Festival is since 1947 the festival for the international performing arts in the Netherlands. In June, the festival programs exceptional and high-profile performances and concerts at different Amsterdam venues. Performances of international quality, mostly from abroad, in music, opera, theatre and dance. Language is generally no problem. More information you find at www.hollandfestival.nl. Every year on April 30, Queensday is celebrated nationwide. All over the Netherlands spontaneous things can be done and festivals are organised. Amsterdam is no exception. 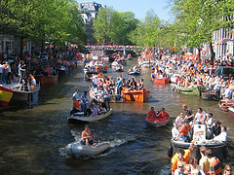 At Koninginnenacht, the night before Queensday, various events take place all over the capital. More about these activities in Amsterdam you find here. The Amsterdam Gay Pride is the main gay and lesbian event in Amsterdam. Streetparties, danceparties, and a cheerfull atmosphere form the Gay Pride. The worldfamous canal parade forms the climax of the Gay Pride. Need to know more? Just visit the Gay Pride website. The Grachtenfestival is an annual music festival, held in August. Classical music on special locations around the city of Amsterdam form this festival. More information about this years program you find here: Grachtenfestival website. Sinterklaas is an authentic Dutch festivity. Sinterklaas is derived from Saint Nicholas. He was a bishop who lived in Turkey. He did a lot of good deeds and became famous all over Europe because of saving his town from starvation, reviving three dead children and calming the sea. Therefore, Saint Nicholas became the patron saint of the sailors and the city of Amsterdam. In Holland the birthday of Sinterklaas is family celebration especially for children. As metaphor of his good deeds, Sinterklaas gives away presents instead of receiving them. Because Sinterklaas is very old now, he has a white beard. He wears a red coat, a red bishops miter and has a long brass staff. Jumping Amsterdam is a horse show jumping competition in the Rai in Oud-Zuid. With 50,000 visitors last year this is one of Amsterdam's largest events. To encourage highly professional standards in photojournalism, the annual World Press Photo event exhibits price winning photoghraphs in the Oude Kerk at Dam square. The World Press Photo website can provide more information. May 5, 1945, the Nazi occupying forces finally surrendered in the Netherlands. In memorial of this event, every year on May 4 we commemorate the death, while on May 5 we celebrate freedom. All over the Netherlands, events take place. In Amsterdam the celebrations take place on the Museumplein. Information about the Amsterdam events can be found here: 'Amsterdams bevrijdingsfestival'. More information about the 5th of May can be found on the 'Nationaal Comite 4 en 5 mei' website. The beginning of the new cultural season is ignited by the Uitmarkt festival. Clips of new theater performances are shown on live stages around the city center. More information can be found on the Uitmarkt website. Every year at the end of September, the Dam tot Damloop sports event takes place. This is a running contest with a maximum distance of 10 English miles. Other distances are 4 English miles for adults and 2.2 kilometres or 0.6 kilometres for children. More information can be found on the Dam tot Damloop website. At the end of October the Amsterdam marathon takes place. 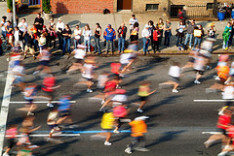 Last year over 22,000 professional as well as amateur athletes ran the 42 km distance. For more information about this sporting event, visit the Amsterdam Marathon website. Museumnacht is a night in which many museums are opened. Apart from the usual museum collections and exhibitions, during this special night, live music, dj's, entertainment and workshops are part of the program. For more information check out the n8.nl website.